In the steadily changing realm of education, the learning has acquired a comprehensive meaning. Considering the evolving need to have relevant education and nurture an approach to stay ready to walk into unexplored territories, the role of universities has turned critical. These days the students have high expectations from their colleges. It is so because most of them wish to eagerly have a good placement just after completing college studies. It is well-known that higher education not only trains them in their chosen field, but also enables them to think analytically, help them understand complex subjects and develop an ability to communicate effectively. Along with getting a good education, these are some of the key factors making people invest money and time on university courses. With rapidly changing job scenario across the globe, it is very important for candidates to choose the universities and other higher education institutes inculcating broad range of future skills. Such kind of skill oriented courses help universities to gain recognition among education fraternity on one hand and help students to be ready as per industry requirements, on the other hand. Also, with Industrial Revolution 4.0 set to change the job trends rapidly across the world, it is very important to make every student ready for unique opportunities not available earlier. With an unprecedented level of competition in every sphere of life, zeroing-in the right university or educational institute for higher education has always been a Herculean task. Understanding the requirements of current job scenario, it is very important for students to choose the universities which focuses on nurturing 21st century skills. With Government of India’s emphasis on imparting world class higher education to country’s youth, private universities are also adopting the best and latest global practices and teaching methodologies. 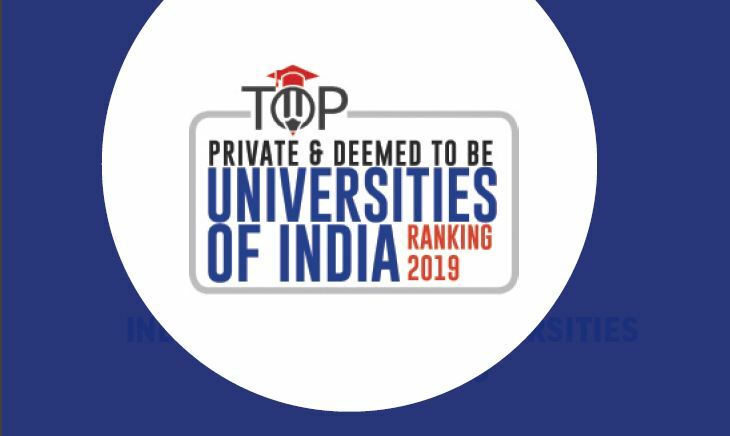 All this inspired us to conduct a comprehensive ranking of “Top Private & Deemed to be Universities of India Ranking 2019” with a view to ensure better exposure for youths in India. In this fifth edition of private university ranking, universities from different zones of India have been ranked on the basis of parameters including Entrepreneurship, Faculty, Industry Interface, Placement, Infrastructure, Global Collaboration and Swachh Campus. In this perception-based ranking, grades have been awarded to every university after considering its overall score under the aforementioned parameters. The mammoth exercise was spread over two months that also involved online voting of users. Let’s have a look how we have ranked them. A good faculty can make or mar the reputation of any educational edifice. Their capabilities, educational as well as aptitudinal, can prove detrimental for any college or university. The impact of faculty members on students’ learning experience can be observed in and out of classroom. Various surveys have found that behaviours and attitudes of faculty affect students profoundly, suggesting that faculty members may play the single-most important role in students’ learning experience. digitalLEARNING magazine considered “Faculty” as one of the parameters for its Top Universities in India Ranking 2019 because to develop a premier educational institution, it is vital to have a good faculty. It not only helps in the cognitive development of students but also restricts the rising rate of brain-drain from the country. Students’ entrepreneurial development has become very significant factor today in view of it being looked upon as financial rise of any company or country. It is so because entrepreneurially trained individuals are frequently thought of as national assets, to be cultivated, motivated and remunerated to the greatest possible extent. It is well-known that entrepreneurs can dramatically influence the way we live and work. If successful, their innovative approach may improve our standard of living, and in addition to creating wealth with their entrepreneurial ventures, they also create jobs and conditions for a prosperous society. digitalLEARNING magazine considered “Entrepreneurship” as one of the parameters for its Top Universities in India Ranking because education is not just to train students for jobs. It is also about developing leadership qualities and approach amongst students. Since entrepreneurial competency can assist in cognitive development, it is a key element to analyse the level of curriculum in educational institutions. What industry needs can be best learnt being in the industry or by the people who represent it. Almost every educational institute understands it and, if possible, doesn’t leave any scope to provide its students such an exposure. With this factor in mind, knowledge of industry needs is an essential step to understand the specifications and skills which the companies look for in their potential employees. Industry participation, thus, is necessary in designing and delivering of courses at any university. The institutes invite personnel from industry to share their experience and wisdom with the students. It provides an opportunity to personnel in the industry to create value for a wide range of people and equip them to integrate better with the industry. “Industry interface” has been considered as one of the key parameters while ascertaining Top Universities in India Ranking 2019. It is so because Academia- Industry Interface plays a crucial role in knowledgedriven economy, where the students pursuing different professional programmes are expected to be well-versed in the industry working style. Higher education institute’s campus holds significance during the learning span of all students. Hence, the infrastructure including lecture rooms to cafeteria and laboratories to hostel holds big importance for every student. In “Top Private University Ranking 2019”, digitalLEARNING magazine considered infrastructure as one of the important parameters while allocating grades to educational institutes. Some of the key factors that have been considered in this light include sports facilities, student accommodation, IT infrastructure, library facilities, research facilities and medical facilities. International partnerships of universities can prove extremely beneficial for students and the university. The economy we are preparing students to enter is global, competitive, and interconnected. For this, the students need to be accustomed to requirements of that scale and nature. For this, students need international exposure which can be made possible through global collaborations. Doing so engages students, enhances their learning, improves inter-cultural awareness, and connects them to the contributions of diverse and valued cultures. The potential power of combined talents between nations could greatly improve the amount of knowledge and possible solutions to these global problems. With the help of unhindered communication channels and inexpensive travel, universities across the world are trying to collaborate with other universities and fostering relationships with other institutions in the world. digitalLEARNING magazine has therefore, used “Global Collaboration” as one of the key ranking parameters for the ranking of universities. While browsing about universities, students prefer educational institutions with higher placement rate. In practical terms, the education received at the university level should also pave the way for employability. And, almost every student wants a job-guarantee at the end of educational career. From student perspective, high quality placements mean a range of benefits and a sense of optimism towards life as a reward of effective education. It is well-known that placements and work experience are big attractions for students, both in terms of academic performance and employability skills. Placements give students the opportunity to acquire real skills linked to their subjects learnt at college, or industry of choice as well as the employability skills required for reallife work. It is an opportunity to be involved in team-based working, which provides a welcome contrast to the typically more individual-centric approach taken to academic study. Thus, we have used “Placements” as one of the key parameters while ranking them. In line with the vision of Prime Minister Narendra Modi, we have also included the Swachh Campus as a parameter in Top Universities Ranking 2019. No matter what but cleanliness can also be a big draw or disappointment for university students. The universities have been ranked on the basis of factors like student/toilet ratio, availability of running water, water supply systems, garbage disposal, garbage disposal techniques and campus’ green cover.